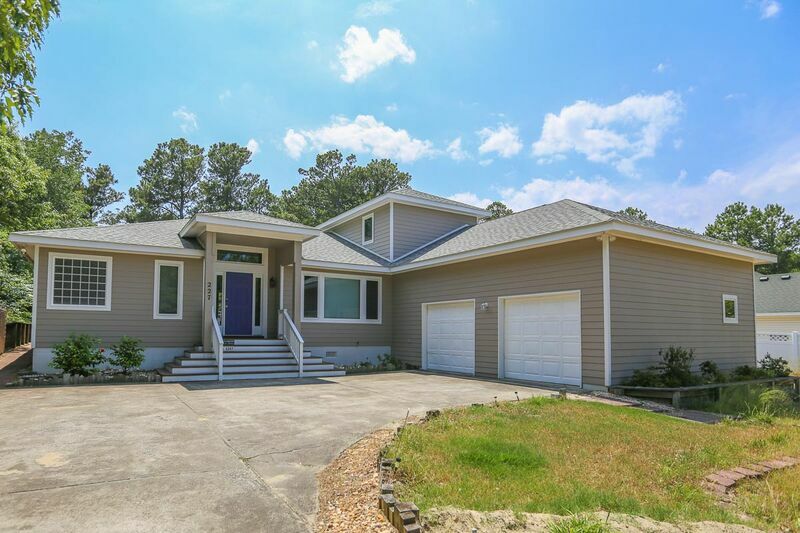 You will truly escape from it all when visiting this Outer Banks vacation home! Picture yourself relaxing in the private pool nestled in the trees or the kids playing ping pong or foosball in the garage. Great room looking out to a nice deck overlooking the pool (with outside shower and toilet), vaulted ceilings, 50” flat screen TV, DVD player, and beautiful hardwood floors. 2 eating areas, 1 with seating for 8 and a smaller table with seating for 4. The kitchen has a small island with seating for 2 and a pantry. 2 master bedrooms (1 with King and a beautiful soaking tub, stand-up, tiled shower, double sink and 32” flat screen TV, 1 with Queen and 32” flat screen TV; each with private bath, walk-in closet and deck access). Laundry room with utility sink, 2-car garage with 1 side set up with a ping-pong table, foosball table, small couch, and extra refrigerator. 2 bedrooms (1 with Queen and Double futon and TV; 1 with Twins and TV), shared hall bathroom. Shore Escape is located in the town of Southern Shores, centrally located on the Outer Banks. A short ride to the Town of Duck will have you walking along the soundside boardwalk where you can enjoy the breathtaking sunset views, the many local shops and outstanding restaurants. Book your week in this OBX rental house and start counting down the days to a memorable escape with your family!